FF-100HM has our original image clarifying technology. 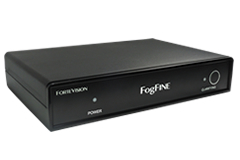 It is an image clarifying unit compatible with digital signals that is effective for improving moving images that are blurred due to factors such as fog, mist, smoke etc. HDMI interface compatible. Easy installation with compact design. Main features Clarifying algorithm specialized for improving fog, moya, smoke, water vapor, dust. Easy installation with HDMI interface support. Automatically compatible with various resolutions (Full HD, HD, SD etc). Audio signal (Linear PCM 2 ch. 24 bit / 48 kHz) compatible. Remote control enables clarifying ON / OFF remote control. ※It can be installed in front of monitor equipment.